Stevia grows best in marshy highlands with warm temperatures and lots of rain and sunshine. Though the stevia plant is not adapted to the cold and is unable to survive frosts, it can still be planted as an annual in temperate regions. Stevia is a perennial plant native to Paraguay and neighboring parts of Argentina and Brazil, where it has been used for hundreds of years to sweeten traditional and medicinal teas. 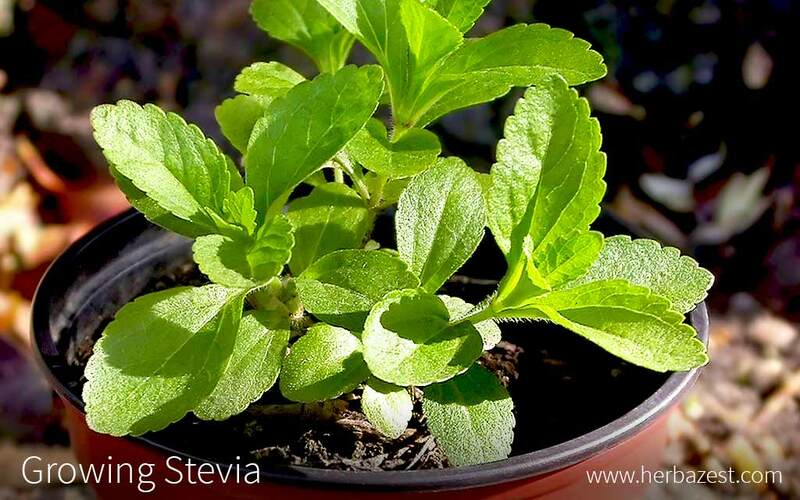 These easy to follow growing guidelines will help you to cultivate stevia at home. Before planting stevia, the field should be plowed and cultivated twice in order to prepare a firm, smooth planting surface. Stevia grows best in well-drained soil that contains a lot of organic matter. If the field is prone to flooding or contains high levels of saline, it is not suitable for growing stevia. Stevia should be planted in mid-May at a spacing of approximately 21 - 24 inches (53 - 61 cm). The germination rate for stevia seeds is not very high. For that reason, it is recommended to plant stevia from transplants or cuttings. However, growing stevia from cuttings is very expensive, so gardeners may opt to grow stevia from seed. It is recommended to germinate stevia seeds in a greenhouse, in plug trays, for seven to eight weeks before transferring them outdoors. Stevia's feeder roots tend to grow near the surface. For that reason, stevia should receive shallow, frequent watering. A good method of providing stevia with consistent moisture is through trickle irrigation. While stevia is relatively drought tolerant, the tips of the leaves starting to droop is a sign that the plant needs water. Because of stevia's low nutrient requirements, it should not be fertilized frequently. While excess nitrogen in the soil has been shown to increase stevia's growth, it also results in a bad-tasting plant. As stevia grows, mechanical row-cultivating can be used to remove and control the growth of weeds. It is also advisable to weed with a hoe or by hand around the plants. Besides cutworm, stevia is not known to have pest issues. This is likely due to the fact that stevia leaves have been shown to have insect-repelling properties, and many insects are discouraged by the sweet taste. Similar to stevia pests, stevia plant diseases are typically few and insignificant. Some diseases, such as septoria, have been reported to cause damage in overly-mature plants. In general, stevia leaves are sweetest right before the plant begins to bloom. For that reason, stevia is best harvested in late summer or early fall when the plants are mature and blooms are beginning to form. Commercial stevia growers use a special harvesting machine that cuts the plant at ground level. However, small-scale stevia plots can be harvested by hand or with a rotary mower. After harvest, the stevia plants should be dried with low heat and good air circulation for one to two days using either a grain dryer or sun exposure. Immediately after drying, the plants should be threshed to separate the leaves from the bitter stems. Dried leaves can be stored for long periods of time in airtight containers in cool, dark environments. Under the right conditions, growing stevia on your own is actually very easy, whether it be in a pot or outdoors. Moreover, because of its intense sweetness, it can be grown on one-fifth of the land needed to cultivate other plant-based sweeteners. This is especially important for promoting sustainable farming practices. Now that you know a bit more about stevia cultivation, you can try it at home.